At the center of the California early learning system are the Learning and Development Foundations. They are the “what” — the knowledge children acquire, the skills they develop, the behavior they learn, and their social and emotional competency. The Desired Results Assessment System, called the Desired Results Developmental Program (DRDP) is the checklist of outcomes that providers should work towards for each child. Here is an assessment worksheet. Learn more in this DRDP slideshow. 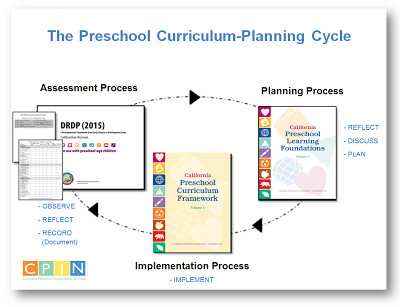 Working backwards from these desired results, Californian providers use the Preschool Learning Foundations to plan a curriculum and the Preschool Curriculum Framework to implement the Foundation standards as adopted by the State Board of Education of California. This is all supported in California by a huge array of resources and professional development programs. The foundations describe competencies that most children can be expected to exhibit in a high-quality program and identify paths of learning that, with appropriate support, children typically move along during the infant, toddler and preschool years. Infant/Toddler Learning and Development Foundations. Learning Foundations draws from research and findings by experts in the field. It has among its philosophies the idea that many children learn simply by participating in high-quality child care and preschool programs that offer environments and experiences that encourage active, playful exploration and experimentation. With play as an integral part of the curriculum, high-quality programs include purposeful teaching to help children gain knowledge and skills. Self, which includes self-aware­ness and self-regulation, social and emotional understanding, empathy and caring, and initiative in learning. Social Interaction, which focuses on interactions with familiar adults, interactions with peers, group participation, and cooperation and responsibility. Relationships, which addresses attachments to parents, close relationships with teachers and caregivers, and friendships. The foundations have the practical elements of teaching young children including setting up environments, supporting children’s self-initiated play, selecting appropriate materials, and planning and implementing teacher-guided learning activities. Two major considerations underlie the practical teaching elements. Teachers can foster early learning by thoughtfully considering the Learning Foundations in the planning of environments and activities. During every step in planning, teachers have an opportunity to tap into the prominent role of play, supporting young children both by encouraging the rich learning that occurs in children’s self-initiated play and by introducing purposeful instructional activities that playfully engage young children in learning. For more information, visit the California Department of Education website here. Los Angeles county offers a separate universal pre-K program known as the Los Angeles Universal Preschool program. It’s for 4-year-old children, regardless of parental income. San Francisco also offers a part-time universal pre-K for all 4-year-olds in some communities. Check out the Office of Early Care and Education or information on child care programs, services and subsidies. Educa helps educators incorporate the California Learning & Development Foundation into their communication with parents, creating understanding and engagement.